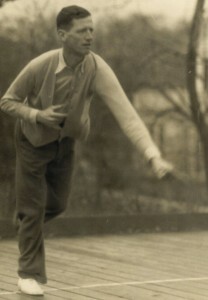 Gatchell was one of the original group of players on the first court and was credited by Blanchard for being an enthusiastic promoter of the game, “carrying the torch into dark places.” He was an active player for over 30 years, and was particularly interested in promoting the game with younger players. When the first Junior Championship was held in 1964 (Boys under 20) the Trophy was dedicated to “Gatch". [Also see APTA 1963 Annual Meeting Minutes] (Fox Meadow Tennis Club). With partner Fess Blanchard, Gatchell was runner-up in the second Men’s Nationals in 1936. This match is the longest recorded in the history of the sport, and the winners, Harold D. Holmes and Richard G. Newell, won 3-6, 8-6, 4-6, 9-7, 15-13 (77 games) after holding 13 match points. Many years later Gatchell and partner Ken Ward with a combined age of 128 years won their first round match in the 1959 Men’s Nationals against a far younger team from Massachusetts. Earle was considered one of the finest screen players of his day and was a frequent umpire at National tournaments. On a more personal note, Gatchell was known for his casual dress style on the court and became something of a fashion trendsetter. Eventually, this casual look, rather than the elegant attire of players, such as Couch and Kilmarx, who often wore neckties, became the game’s norm. Gatchell was born in Philadelphia, PA in 1891 and grew up in Rutledge, PA. He graduated from Swarthmore College with and A.B. in 1914 and then served in the Army during WWI, rising to the rank of Captain. After the war he went back to Swarthmore and obtained a degree as a Mechanical Engineer and started working for Central Coal and Iron Co. in Central City, KY. Shortly thereafter he made a career switch into banking and started his own investment business in New York City where he had associations with North American Securities Co., G. M. P. Murphy and Co., Cohu & Co. before joining F. S. Moseley & Co. as manager of the wholesale department in 1937. He was with F. S. Moseley for the next ten years with a hiatus from 1942-1945 when he served during WWII in the Army’s Ordinance Department in Washington DC where he was in charge of testing and accepting smokeless powder and high explosives. He was posted to Australia for a period that also included stints in Guadalcanal and the Solomon Islands. On being discharged as a lieutenant colonel he returned to F. S. Moseley. 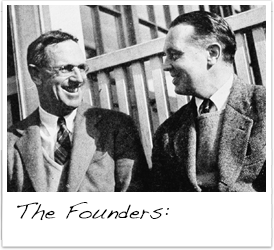 In 1947 he joined Hayden, Stone & Co. as the manager of the dealer and correspondent department and became a general partner in 1953. He retired in 1961 and died of a heart attach in 1962 while visiting relatives in Philadelphia. 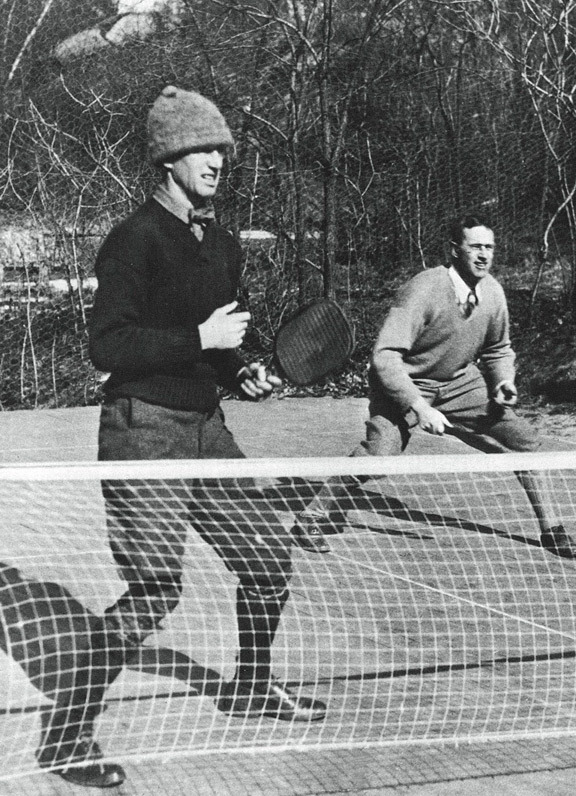 Gatchell originally lived in New York City when he started his investment career but had move to Scarsdale NY in 1925 and became involved with the early development and promotion of the game as a member of the Old Army Athletes (he lived down the hill from Cogswell on Lynwood Road) and later at Fox Meadow Tennis Club where he was very active in the club’s paddle and tennis programs. As a Mechanical Engineer he was an excellent addition to the Cogswell team building the first court on Old Army Road and in subsequent court improvements. The Gatchell family moved from Scarsdale to West Chester, PA during the period that Gatchell was posted overseas but they moved back upon his honorable discharge. Outside of paddle he was active in the Scarsdale Boy Scouts and local operetta with a particular love of Gilbert and Sullivan. Earle Gatchell on the first court built on Jimmy Cogswell's property in Scarsdale, NY.